It is that time of year where one day the fishing can be great and the next day it can be a dog. The thing to remember when the fishing is up and down like this is that fishing is a lot like hunting. You have to put some work in on occasion to be successful. Always in August we will see the results of a lot of pressure on the lake, meaning that the lake gets a little fished out and the catching side of fishing isn’t as easy as you may want it to be. Be patient and persistent and hopefully you will be rewarded. DFW did stock this past week and are on schedule to stock again this coming week and we are on schedule to get a nice load of Desert Springs Fish out of Oregon with a total of 400 pounds coming towards the end of this next week so that should help with the catching side as well. 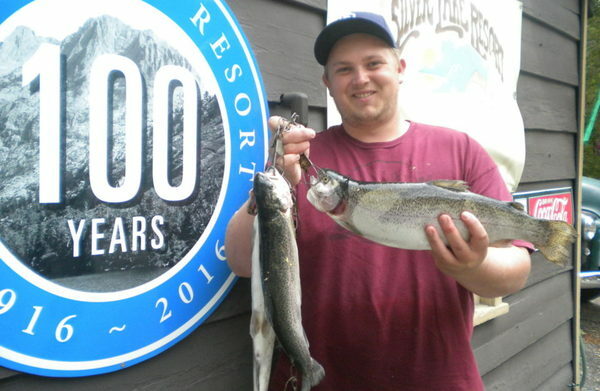 Anglers have been going as deep in the waters as they can, looking for the cooler waters where the fish are hanging out. 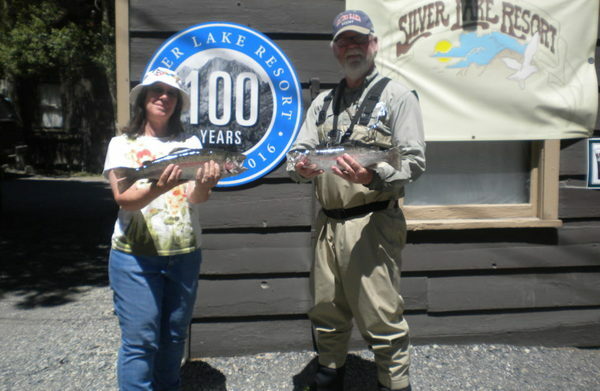 Bait fishermen have been seeing best results on a boat at the far side of Silver Lake where Rush Creek dumps into the lake where they have been using Berkley Power Baits in Rainbow Glitter Garlic, Pinch Crawlers and Berkley Mice Tails in all bright colors. Trolling late in the day with a Rapala or Tasmanian Devils have been decent as well as pulling some streamers like an Olive Matuka or Olive Wooly Bugger. Look for the best action to be on the turn as your streamer will slow down and sink deeper allowing those nice Rainbows a chance to see what your offering. Don’t get discouraged by not limiting out, stay true to what you know and things will work out. Like we all love to say, that’s why they call it fishing and not catching. Catching takes work!!! 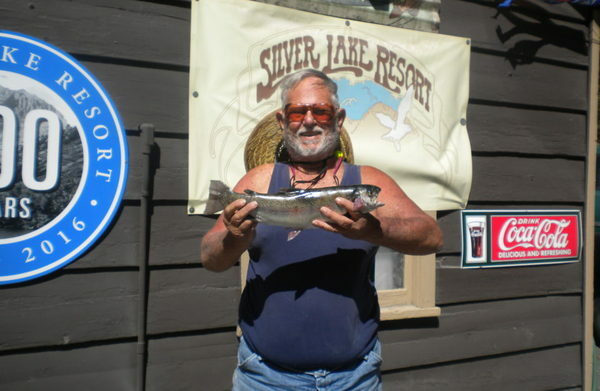 Silver Lake Resort will be having live music by local artist Jeffrey James and a Pot Luck this Tuesday August 9th in the Silver Lake Resort RV Park. Come on down and share a dish at the Pot Luck starting at 5 pm followed by live music at 6pm with smore’s provided at the fire pit for all to enjoy. Randi Fein of Vacaville had to show the boys how to fish this week when she landed this nice 2 pound 8 ounce Rainbow caught trolling a streamer on Silver Lake. It wasn’t to hard to out fish the Fein boys this week but Randi did it all week long. She caught this nice 2 pound 8 ounce Rainbow using an Olive Matuka or better known as a “Dodger Catcher” to the Fein Family, as much like the Men in Blue, always catching a winner. I think her secret passion for being a Dodger Fan helped her out this week. Don’t worry Randi, its alright to be a Dodger Fan, the rest of the family secretly root for the Dodgers Too!!!! Its good to root for winners!!!! Nice Fish and an Even Better Week by the Fein Family!! “Big Fish Bob” took the week off but I’m sure he will be back in the report next week.